Vontimitta, 6 February 2019: To speed up major development works in Sri Kodanda Ramalayam at Vontimitta in YSR Kadapa district, before annual brahmotsavams, regular inspections will be carried out, said TTD EO Anil Kumar Singhal. Speaking to media here on Wednesday after inspecting the ongoing developmental works along with Tirupathi JEO P Bhaskar, CVSO Gopinath Jetti and CE Chandrasekhar Reddy, he said, the construction works at Kalyana Vedika are going on a fast pace. 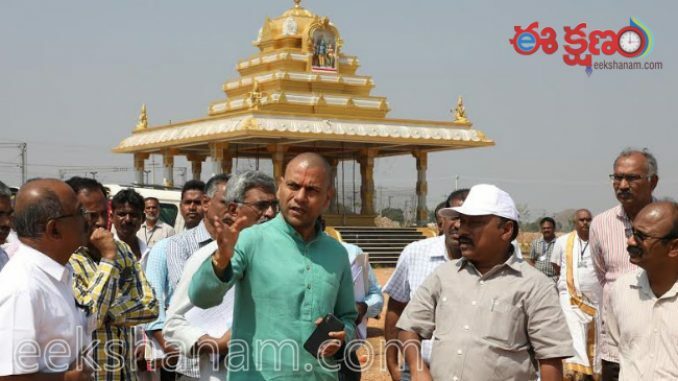 “During last month on January 2, we instructed the work contractors to complete all the construction of permanent structures before Brahmotsavams in second week of April here. Apart from this, the beautification and greenery works taken up Forest department will also be completed. Next month there will be another round of inspection by senior officers of TTD on March 7”, he added. Suptd Engineers Ramesh Reddy, Venkateswarlu, DyCF Phanikumar Naidu, Estate Officer Vijay Sarathi, Temple DyEO Natesh Babu, AEO Ramaraju, Executive Engineer Jaganmohan Reddy, Des Ravishankar Reddy, Chandrasekhar, Addl Health Officer Dr Sunil and others took part. Later he reviewed the developmental works of Vontimitta Temple with Joint Collector, Kadapa, P Koteswara Rao IAS, RDO of Rajampeta Kodandarami Reddy at Vontimitta. TTD EO Anil Kumar Singhal.